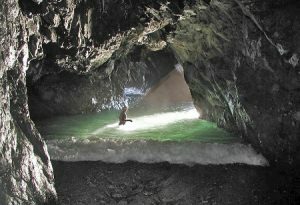 Sea Caving. Photo by Dave Bunnell. In 2016, I returned to the Island just a day or two after Cuban leader Fidel Castro died. Nine days of national mourning were declared and it was eerily quiet. 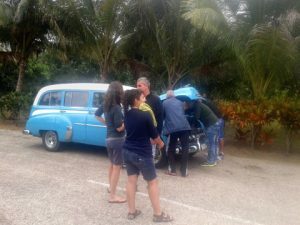 This was a different Cuba from previous visits; the sounds of music blasting over the beach, drunken tourists fighting with their spouses and never-ending parties were noticeably absent. There wasn’t a drink to be had so I went hiking. 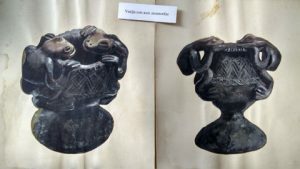 It was while walking through the Varahicacos Ecological Reserve, I stumbled upon the idea that sinkholes and caves might have set the stage for an underground civilization. From the time of the Neanderthal, humans have utilized caves but I wonder if an entire civilization could have developed underground and more specifically, by the sea. “It’s like going to to Pluto and seeing McDonald’s”. – Japanese Researcher on finding microbes living more than 2 kilometers below the sea floor. In my Archaeology 101 course, the professor mentioned that human civilization has grown up around wheat and agricultural crop production. But I wonder; previous to wheat cultivation, could there be an advanced ancient sea harvesting or fishing civilization? If so, did such a maritime civilization go underground? Since caves are often carved out by water and water is the staff of life, it makes sense that some creatures call the systems home. The life of a cave environment is highly evolved to survive in the absence of sunlight. “We know more about space than the underground waterways coursing through the Earth”. -Jill Hein, Cave Diver, TEDYouth 2015. Human Beings have a history of cave dwelling but I think there would be many survival challenges to being there 100% of the time. Humans can use caves as shelters but most of us have evolved and adapted to life on the surface. Despite the theories of a “Hollow Earth” people, Vitamin D from sunlight is necessary and a Earth surface mixture of nitrogen-oxygen is highly recommended for breathing. An amphibious creature would be better adapted to watery cave environments. For example, in places like the Mammoth Cave National Park of Kentucky USA we find salamanders, toads, and frogs happily dwelling in the dark. So to take things a few steps further; did an amphibious civilization evolve under the sea that now builds UFOs (or USOs)? “Oannes (Ὡάννης) was the name given by the Babylonian writer Berossus in the 3rd century BC to a mythical being who taught mankind wisdom. Berossus describes Oannes as having the body of a fish but underneath the figure of a man. 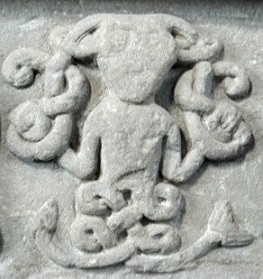 He is described as dwelling in the Persian Gulf, and rising out of the waters in the daytime and furnishing mankind instruction in writing, the arts and the various sciences” (see https://en.wikipedia.org/wiki/Adapa#As_Oannes). The Mermaid or Mermen are found in folklore throughout the world. This is the classic half-fish / half-human combination. More recently, the Best Picture Oscar was given to director Guillermo Del Toro for The Shape of Water, a movie about a woman who gets into a sexual relationship with an Amphibious humanoid creature. A big influence on Del Toro is H.P. Lovecraft who wrote a well-known horror story called Dagon involving a similar being. Cuba itself, has multiple cave systems. On my second trip to Varadero, I took the Matanzas city tour that included the Bellmar caves. This fascinating excursion took us past stalactites and stalagmites down to the shores of an underground lake. It looked like amphibian real estate to me! From the blue holes of the Bahamas, to Sac Actun of Mexico to the Camuy River Cave Park of Puerto Rico, the seas and islands of the West Indies are full of hiding places and nesting spots! In order to swim on vacation, I bought an underwater money belt. As a solo traveler, I find it difficult to leave money in hotel safes. I sometimes hear horror stories about people getting robbed and so brought an underwater belt to keep essentials with me. I also brought a snorkel but a gag reflex that plagues my eating gave me problems underwater. I decided to try again and a month later I was back in Cuba with snorkeling kit in hand. In the Havana airport, I met a young couple who soon became friends. “Carla and Carlos” (not their real names) were originally from Colombia but now living in Toronto. They were Spanish-speaking and were kind enough to interpret. My new friends met a man on the beach who sold us a “Cuba tour” that included snorkeling and points of interest. The tour guide was a honorable man who I will refer to as “C”. We were picked up by a good-natured driver in an old Ford; I will call him “Y”. Neither C or Y could speak English so I was dependent on my friends to translate. “C” took us for breakfast but my gag reflex returned and I had to find a place to cough it up. It seemed an omen of things to come. The 1950s car kept breaking down and we had to repeatedly give it a push to get started. “C” was noticeably embarrassed as was “Y”. It was clear “C” had spent a lot of time planning but had not anticipated such bad luck. The tour took us across the narrow width of Cuba. We saw alligator and bird breeding stations as Cubans are active stewards of their natural environment. There was also a petting zoo with some very odd-looking creatures (don’t pet the alligators!). On the final stretch of highway we saw a large number of graves to fallen soldiers. The array of monuments all looked alike and sadly reappeared at consistent intervals. We ended up at a War museum featuring the Cuban perspective on the Bay of Pigs invasion. I was shocked to see the photos of Cuban soldiers in the conflict as many looked like teenagers – the sort of young, skinny guys you might expect to see in high school playing baseball or taking their girlfriends to movies. Incredibly, it was where we ended up snorkeling; the Bay of Pigs! The Caribbean was unusually cold but I was soon immersed and looking into an underwater world. The visibility was good and my gag reflex was gone. Strange underwater plants grew in the Bay and colorful fish approached me. Despite the cold water, I didn’t want to return to shore and “C” had to shout to get everyone back. From there, we went for a delicious seafood dinner and a generous helping of wine but the car trouble soon reappeared. On the way home over hills, valleys and winding roads, lamps flickered until the electric gave out altogether and the car was without headlights! “C” was beyond consoling and “Y” looked up to the sky. I felt for them. I have coordinated special events and know that nothing goes as planned. They had put so much energy and hope into the tour and were truly proud of their country. Communist or not, they wanted to show us what the Cubans had accomplished. Car trouble aside, I think they succeeded. It soon occurred to me that if we hit another car head-first, we would end up in the land of the dead! In the seats behind, the spirit of wine took over and the others weren’t so concerned. With each bump in the road they laughed themselves silly. My friends howled with delight as I stared into the darkness. Nevertheless, we made it back in one piece and after shaking “C” and “Y’s” hand, I went to my room and fell into deep sleep. My friends told me of their Ayuausca experiences in the Colombian rain forest. Carlos was researching the drug for his Master’s thesis and Carla told me after taking the drug, a gigantic, much ‘larger than python’ snake slid and shook the forest and finally appeared in the clearing. That was before it told her to relax! I wondered if the ancient Caribbeans spoke to intelligent reptilian or amphibious creatures while drug-taking. 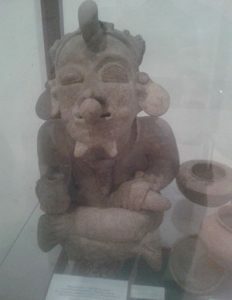 I thought of the amphibian and serpentine imagery in the archaeological museum and would later see more at the Montaine Museum of Anthropology in Havana and at the Mayan ruins of the Yucatan in Mexico (Another trip – see Exploring the Mysterious Mayan Coastline). UF0s and paranormal activity can often seem dream-like. This is what UK researcher Jenny Randles calls “the Oz effect” with reference to the classic children’s story “The Wizard of Oz”. The Oz Effect is a sort of strange state of consciousness that coincides with the paranormal and can be likened to the awakening experience of the storie’s main character, a young girl named Dorothy. A native of Kansas, Dororthy’s home gets caught up in a spiraling vortex tornado and she wakes up in the foreign and rather strange land of Oz. Likewise, I wondered if the intelligent sea dwellers could have evolved into interdimensional travelers that step in and out of our reality. All of my stories, unconnected as they may be, are based on the fundamental lore or legend that this world was inhabited at one time by another race who in practicing black magic, lost their foothold and were expelled yet live on outside ever ready to take possession of this Earth again”.